Avengers... I mean... readers assemble! Today I have an upcoming collection to share with you from the wonderful brand Ninja Polish! 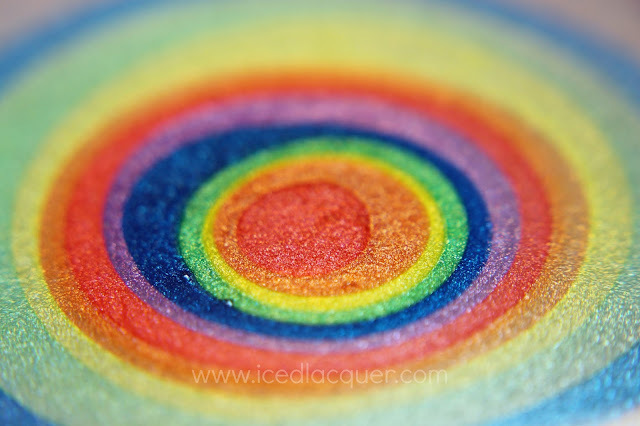 This Infinity Gems collection is based on the Marvel Infinity Gems (also known as Soul Gems) and consists of seven linear holographics and one microglitter topper. Don't they look simply MAGNIFICENT?! "Power" - A cherry red linear holographic. I'm pretty sure this would match perfectly with Iron Man's suit. If you were to layer a coat of "Infinity Gauntlet" on top of this you'd basically have the perfect Iron Man-icure. Heh heh. I used just two coats here. "Time" - An orange-copper linear holographic. The brown tones in this one make it a fairly wearable orange for me. I used two coats. "Reality" - A green-toned yellow linear holographic. I'd say it's part yellow, gold, and green. Really interesting shade of yellow if you ask me. I used three coats. "Soul" - A grass green linear holographic. I'd say it's a little bit deeper and not quite as chartreuse as the Hulk. 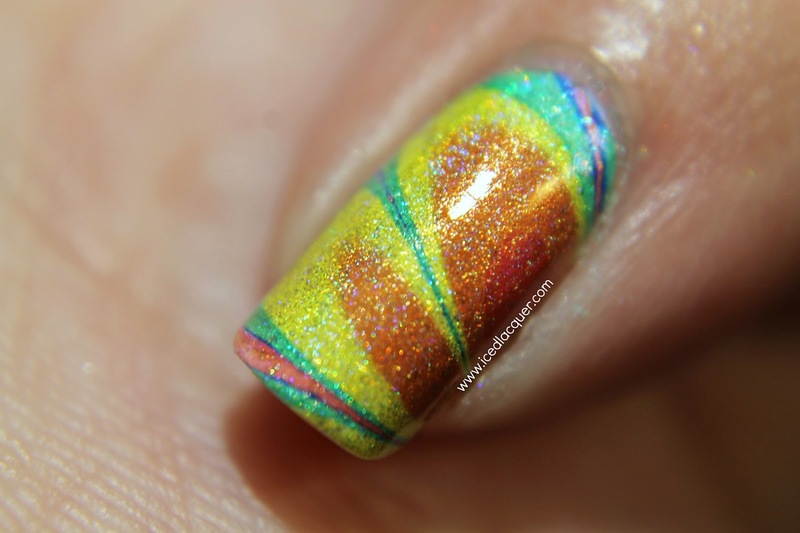 I liked the opacity of this one at three coats. "Mind" - A deep royal blue linear holographic. If Captain American wore nail polish I think he'd totally wear this one. If I had been more careful I think it would be a one-coater (YES! ), but I used two here. "Space" - A medium lavender linear holographic. This one seems to be the most holographic of the bunch. I love that it is a bright purple but still appears somewhat soft. I used three coats. 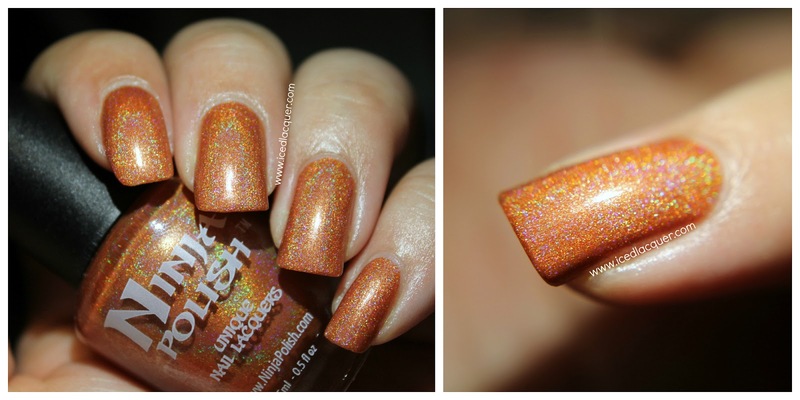 "Infinity Gauntlet" - A clear-based glitter topper filled with gold holographic microglitter. I think this one works more as a topper rather than a full opacity microglitter, but you might be able to build it up on its own. I used two coats over Ninja Polish "Obsidian Dreams". (P.S. I wish I had an Infinity Gauntlet prop so I could have worn it while taking the photos of this one. I also wanted to mention that this collection water marbles beautifully! Just look at all those rings I was able to get! Such a good spread! I attempted to do some patterns, but I am horrible at water marbling so I'll just show you my pinky, which seemed to turn out pretty well. Price: $60 for the full set! P.S. I don't think I've said anything on my blog let, but I wanted to let you all know that I'm currently swatching every single Ninja Polish shade! Past, present, and future! 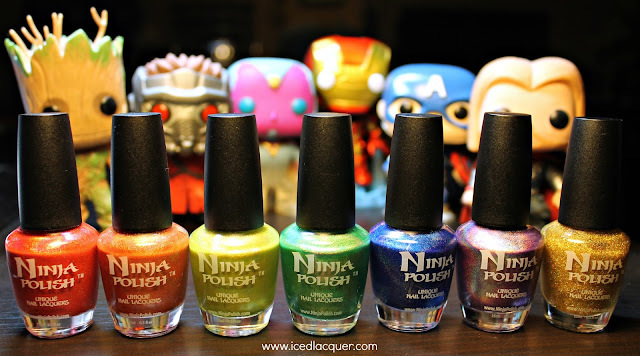 I'm so honored and excited to be working with Ninja Polish. It's going to be a big job, especially because I'm trying to be really particular about consistency, but I'm excited to work my way through them! I'll be sure to let you know when I'm all finished! I really like Mind and Space, and I love that they water marble so well! Absolutely gorgeous! That blue and purple is amazing.